Are Quavo and Jeff Goldblum up to something? 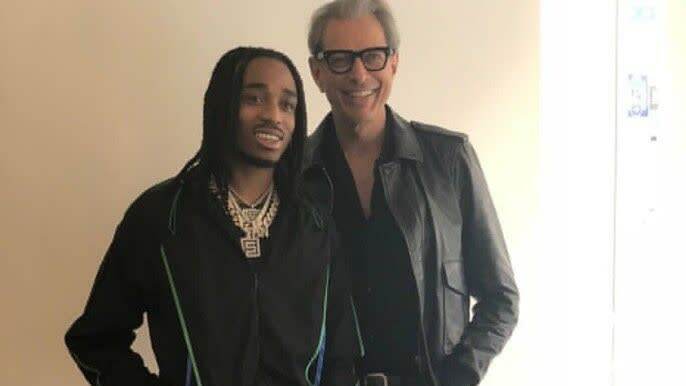 A photo of Quavo and Jeff Goldblum meeting for presumably the first time is beginning to circulate online, with many wondering exactly what the two are up to. The Migos rapper and the Jurassic Park actor were both all smiles, as the two posed for a portrait and flexed for Instagram. Goldblum tagged the location as the Beverly Hills location of Yves Saint Laurent, captioning the image, "That's chaos theory!" (a famous quotable from the iconic 1993 film) while Quavo left fans wondering by simply writing "JURASSIC PARK." Without further explanation, fans took to Instagram and Twitter alike to contemplate what destined force brought the two together, with some brainstorming movie plots and others wondering if the famed actor will be featured on Migos' forthcoming album, Culture 2. Yup, some took it there. Take a look at the memorable meeting and see how some fans are letting their imaginations go wild in the posts below. Maybe there's hope in 2018. Quavo builds a machine that transforms Jeff into a 21 year old trap star turned rapper. New Music: Mike WiLL Made-It taps Big Sean, Quavo, and Rae Sremmurd for "Aries Yugo Part 2"